Hi I’m Cynthia from What a Girl Eats. I am a classically trained cook. I attended the California Culinary Academy where I completed their 16 month Master Chef’s program. After graduating I worked in London. My husband and I traveled around the world on our honeymoon, which is why my blog’s tagline is “healthy food with a global spin”. By day I am a kindergarten teacher with a Master’s degree in teaching English to second language learners. I love cooking healthy food and hope to inspire others that cooking is easy and fun with simple recipes using real ingredients. 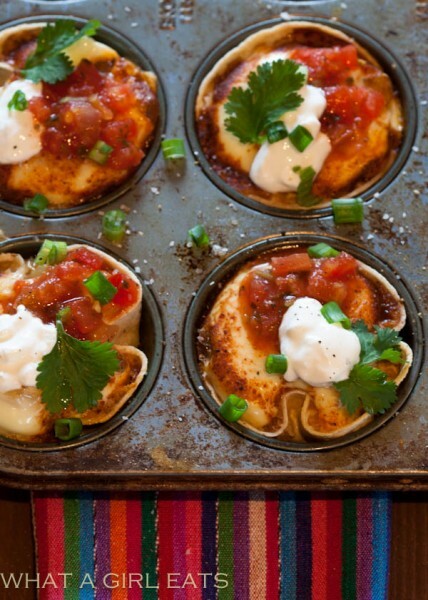 These super easy Mexican Egg Cups , a take-off on Huevos Ranchero, are perfect for a brunch. Baking them in a muffin tin enables you to cook a dozen (or more) at once. You can jazz them up with hotter sauce, depending on your crowd. I used a medium enchilada sauce for my guests. Small corn tortillas, about 4″ in diameter, fit into the muffin tin perfectly, but a larger tortilla would work as well. Grated cheese, any kind, I used sharp cheddar, but Mexican cojita or pepper jack would be great as well. Oil the sides and bottom of a muffin tin. Soften 12 small, 4″ tortillas in the oven or microwave, until soft and flexible, about 25 seconds for 4 tortillas. Press tortillas into each cup. Add one tablespoon of enchilada sauce into the bottom of each tortilla cup. Add one tablespoon( or so) of grated cheese. Crack an egg on top of sauce and cheese mixture. Season with kosher salt and cracked pepper. Top each egg with 1-2 teaspoons additional enchilada sauce. Bake in the center of the oven for approximately 20 minutes. Top with salsa, sour cream, cilantro and green onions. Please visit Cynthia on her blog, over on Facebook, Twitter, Pinterest and Google+. Oh, thank YOU Nettie! I just got home from work and saw it! That looks wonderful! Cynthia always has such flavorful recipe ideas! Great post! Those look delicious, I sure want them for breakfast today!! !